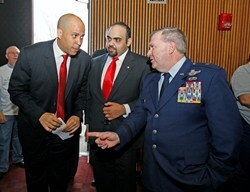 At the U.S. Senate Debate in Montclair State University, Newark Mayor and Senate Candidate Cory Booker discussed his credentials and accomplishments in the city, including his partnership with the GI Go Fund to create the first ever nonprofit run office for Military Veterans and their families to help them find jobs and collect their benefits. During the closing moments of the U.S. Senate Debate in Montclair State University on Monday night, Newark Mayor and Senate Candidate Cory Booker discussed his credentials and accomplishments in the city that he believes make him most qualified for the open seat left by the late Senator Frank Lautenberg. Mainly, he used the opportunity to distinguish himself from candidates Frank Pallone and Rush Holt, both of whom are U.S. Congressman in the state, by highlighting how he worked to help people when Washington, DC did not. Chief among his points was his partnership with the GI Go Fund to create the first ever nonprofit run office for Military Veterans and their families to help them find jobs and collect their benefits. “When Washington couldn’t get it right for our veterans coming home, we started New Jersey’s first ever veterans one stop in a municipality, helping veterans in Newark and all of our surrounding areas," said Booker. Since opening its doors in 2008, the GI Go Fund veterans’ one stop center, which the Mayor put directly near his own office, has helped tens of thousands of veterans and their loved ones get the help they need. One of the ways they help is through their Midnight Missions for Homeless Veterans, which involve scores of volunteers going out before dawn to areas with large numbers of homeless veterans to provide them with food, clothing, emergency medical assistance from the VA, all while gathering the information they need to help get the veterans off the street for good. This program has received nationwide recognition, including being featured on the ABC hit reality show “Secret Millionaire”. “When we opened our doors five years ago, our goal was not just to help veterans, but to do so in a way that had not been done before,” said GI Go Fund Executive Director Jack Fanous. “The Mayor really challenged us to do more than just aid the veterans who walk through our door, but to go out and seek the veterans directly; to find them and help them with what they need. And we have done our part in answering that call, creating a smarter government approach that has helped thousands of veterans in and around the city. The organization has also led the charge in helping veterans in the area find employment. Just this year alone, they hosted a Newark Job Fair in the city that linked more than 500 veterans with nearly 75 employers offering both blue and white collar jobs, as well as hosting a “Rebuild the Shore” Job Fair last week which saw over 250 veteran jobseekers, and will host a hiring event in Burlington County this fall. Moreover, the group has held multiple career workshops with Fortune 100 Companies like Johnson & Johnson, Ernst & Young, PSEG, Prudential, and Citi. GI Go also partnered with the city to create the Newark Veterans Court, which takes veterans arrested within the city and connects them to state and federal benefit providers such as the VA, Department of Labor, Social Security, and the NJ Department of Military and Veterans Affairs to help them with PTSD and any drug or alcohol related issues, as well as linking them to veteran mentors who can talk to them about their problems and help them end their criminal tendencies once and for all.